How random walks can help tourism, Claudio Lucchese and Raffaele Perego and Fabrizio Silvestri and Hossei Vahabi and Rossano Venturini, in Proc. 34th European Conference on Information Retrieval (ECIR), 2012, to appear. From Chatter to Headlines: Harnessing the Real-Time Web for Personalized News Recommendation, Gianmarco De Francisci Morales, Aristides Gionis, Claudio Lucchese, in Proc. 5th International Conference on Web Search and Data Mining (WSDM), 2012 to appear. On kNN Classification and Local Feature based Similarity Functions, G. Amato, F. Falchi, in Communications in Computer and Information Science (CCIS), LNCS, Springer-Verlag, to appear. Geometry-aware image localization, Luca Benedetti, Massimiliano Corsini, Fabrizio Falchi, Paolo Cignoni, Matteo Dellepiane, Roberto Scopigno, Int. Conf on Computational Photography 2012. PileBars: Scalable Dynamic Thumbnail Bars, Paolo Brivio, Marco Tarini, Federico Ponchio, Paolo Cignoni, Tech. Rep., CNR-ISTI, January 2011. Local Feature based Image Similarity Functions for kNN Classification, G. Amato, F. Falchi, in the 3rd International Conference on Agents and Artificial Intelligence (ICAART 2011), Roma, Italy, 28-30 January 2011, Sci-TePress (Portugal),pages 157-166. 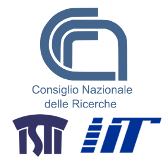 Similarity caching in large-scale image retrieval, Fabrizio Falchi, Claudio Lucchese, Salvatore Orlando, Raffaele Perego, Fausto Rabitti, Information Processing & Management, February 2011. Identifying task-based sessions in search engine query logs, Claudio Lucchese, Salvatore Orlando, Raffaele Perego, Fabrizio Silvestri, Gabriele Tolomei, WSDM 2011: 277-286, 9-12, February 2011. Processing a complex Architectural Sampling with MeshLab: The case of Piazza della Signoria, Marco Callieri, Paolo Cignoni, Matteo Dellepiane, Guido Ranzuglia, Roberto Scopigno, in 3D-Arch 2011, 4th International Workshop: 3D Virtual Reconstructions and Visualization of Complex Architectures, 2-5- March 2011, Trento, Italy. Efficient Diversification of Search Results using Query Logs, Claudio Lucchese, Gabriele Capannini, Raffaele Perego, Fabrizio Silvestri, in Proceedings of the International World Wide Web Conference (WWW 2011). Hyderabad (India), March-April 2011. Landmark recognition in VISITO: VIsual Support to Interactive TOurism in Tuscany, G. Amato, P. Bolettieri, F. Falchi, In The First ACM International Conference on Multimedia Retrieval (ICMR), Trento, Italy, April 17-19, 2011. Indexing Support Vector Machines for Efficient top-k Classification, G. Amato, P. Bolettieri, F. Falchi, F. Rabitti, P. Savino, in Proceedings of the Third International Conferences on Advances in Multimedia, MMEDIA 2011, Budapest, Hungary, April 17-22, 2011,XPS (Xpert Publishing Services), 2011, ISBN: 978-1-61208-005-5, pages 56-61. Landmark Recognition in VISITO Tuscany, G. Amato, F. Falchi, F. Gennaro, in Proceedings of the International Workshop on Multimedia Cultural Heritage (MM4CH), Modenam, Italy, May 3, 2011. Space-efficient substring occurrence estimation, Alessio Orlandi and Rossano Venturini, in Proc. 30th ACM SIGMOD-SIGACT-SIGART Symposium on Principles of Database Systems (PODS)}, 2011, pages 95-106, June 12-14 2011, http://doi.acm.org/10.1145/1989284.1989300. Combining Local and Global Visual Feature Similarity using a Text Search Engine, G. Amato, P. Bolettieri, F. Falchi, C. Gennaro, F. Rabitti, in Content-Based Multimedia Indexing (CBMI), 2011 9th International Workshop on, Madrid, Spain, 13-15 June 2011. IEEE Computer Society (New York, NY, USA), 2011, ISBN: 978-1-61284-432-9,pages 49-54. Geometric Consistency Checks for kNN Based Image Classification Relying on Local Features, G. Amato, F. Falchi, C. Gennaro, in Proceedings of the Fourth International Conference on SImilarity Search and APplications (SISAP 2011), Lipari, Italy, June 30 - July, 2011 ACM New York, NY, USA, 2011, ISBN: 978-1-4503-0795-6, pages 81-88. VISITO Tuscany: Landmark Recognition for Cultural Heritage, G. Amato, F. Falchi, P. Bolettieri, ERCIM News, 86, July 2011 - Special Theme: ICT for Cultural Heritage, ISSN 0926-4981: pages 22-23. Security for Mobile Sytems, G. Costa, A. Lazousk, F. Martinelli and P. Mori, accepted under revision on Dependability and Computer Engineering: Concepts for Software-Intensive Systems, July, 2011. PileBars: Scalable Dynamic Thumbnail Bars, Paolo Brivio, Marco Tarini, Federico Ponchio, Paolo Cignoni, and Roberto Scopigno, Int. J. Computer & Graphics, Elsevier, 2011. PhotoCloud: real-time web-based interactive exploration of large mixed 2D-3D datasets, Paolo Brivio, Luca Benedetti, Marco Tarini, Federico Ponchio, Paolo Cignoni, and Roberto Scopigno, IEEE Computer Graphics and Applications, IEEE Press, 2011. Evaluation of Visual Features for Automated Recognition of Artifacts, Giuseppe Amato, Fabrizio Falchi, Paolo Bolettieri, in Proceedings of the Fourth Italian Research Conference on Digital Library Systems, IRCDL 2010, Padova, Italy, 28-29 January 2010. Proceedings Eva Florence, 21-23 April 2010. Recognizing Landmarks Using Automated Classification Techniques: an Evaluation of Various Visual Features, Giuseppe Amato, Fabrizio Falchi, Paolo Bolettieri, in Proceeding of The Second Interantional Conference on Advances in Multimedia (MMEDIA 2010), Athens, Greece, 13-19 June 2010, IEEE Computer Society, 2010, ISBN: 978-0-7695-4068-9, DOI 10.1109/MMEDIA.2010.20, pages 78-83. Scaling Out All Pairs Similarity Search with MapReduce, R. Baraglia, C. Lucchese, G. De Francisci Morales, in 8th Workshop on Large-Scale Distributed Systems for Information Retrieval, co-located with ACM SIGIR. Geneva, Switzerland, July 23, 2010. Detecting Task-Based Query Sessions Using Collaborative Knowledge, Claudio Lucchese, Salvatore Orlando, Raffaele Perego, Fabrizio Silvestri, Gabriele Tolomei, Web Intelligence/IAT Workshops 2010: 128-131. August 31 - September 3, 2010. An approach to content-based image retrieval based on the Lucene search engine library, Gennaro C., Amato G., Bolettieri P., Savino P. , in ECDL 2010 - Research and Advanced Technology for Digital Libraries. 14th European Conference (Glasgow (UK), 6-10 September 2010). Proceedings, pp. 55 - 66. Mounia Lalmas, Joemon Jose, Andreas Rauber, Fabrizio Sebastiani, Ingo Frommholz (eds.). (Lecture Notes in Computer Science, vol. 6273). Springer, 2010.
kNN based image classification relying on local feature similarity, G. Amato, F. Falchi, in Proceedings of the Third International Conference on SImilarity Search and APplications (SISAP 2010), Istanbul, Turkey, 18-19 September 2010, ACM, New York, NY, USA, 2010, 2010: pages 101-108. Browsing large image datasets through Voronoi diagrams, Paolo Brivio, Marco Tarini, Paolo Cignoni, IEEE Trans. on Visualization and Computer Graphics, Vol.6 (6), Nov.-Dec. 2010, IEEE Computer Society, pp.1261-1270. Document Similarity Self-Join with Map Reduce, Ranieri Baraglia, Gianmarco De Francisci Morales, Claudio Lucchese, ICDM 2010: 731-736, 14-17 December 2010, Sydney, Australia.